His research tells him that greater happiness is often found when we do more Deciding, Designing and… well, just Doing. 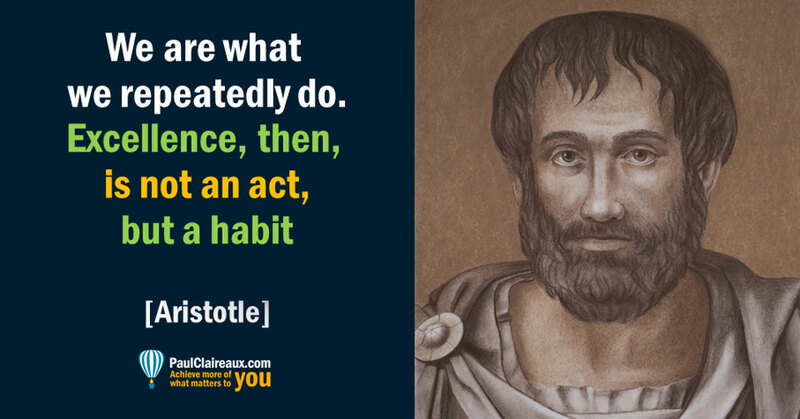 Which chimes perfectly with what the Greek philosopher, Aristotle said over two thousand years ago. So, it seems that if we repeatedly do our work – in a well-directed way – excellence is the likely result … and that can often lead to raised self-esteem. This does not, of course, work the other way round. We can’t just focus on our self-esteem and expect to become excellent at something… a dangerous myth put out by the positive psychology movement decades ago – leaving modern psychologists to clear up the mess. Watch the videos of Susan David and Carol Dweck, in this Insight, for more on that. However, whilst ‘deciding’ to take on a challenging life goal might remove the stress of uncertainty from procrastination, there’s obviously one step to deal with before we get to that point… and that’s when we ‘Choose’ which goals to consider in the first place. Just getting to the ‘deciding’ point, before we start ‘designing’ and ‘doing’, is, as you probably realise, not always easy. So, understanding the emotions that prevent us from making life choices – and deciding which to tackle first – can be hugely valuable. According to Psychiatrist Dr David Burns (in his acclaimed and wonderful book, ‘Feeling Good’), we have at least 10 reasons for putting things off – which I’ve endeavoured to compress into 5 areas here. For the expanded list of reasons and Burn’s thinking behind them, get his book. Obviously, if we’re too afraid of failure, we’ll go to great lengths to avoid it. And we can certainly avoid being accused of failure if we say that we’re not really trying to achieve a particular life goal. Fear of failure is, however, a perfectly natural emotion and is certainly not all bad, as some motivational ‘gurus’ will tell you. 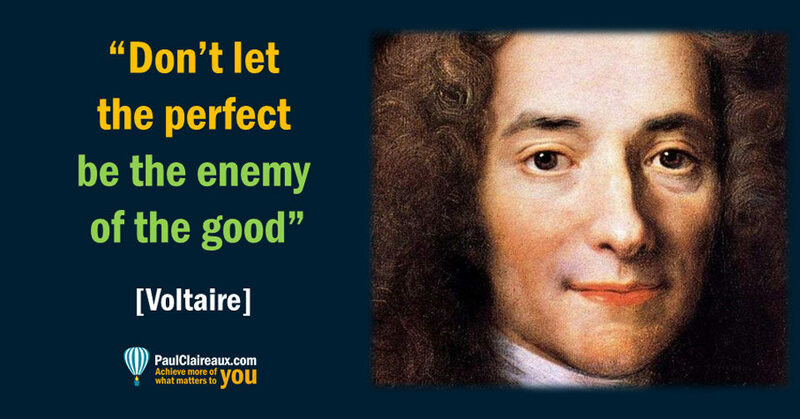 Perhaps we’ve somehow acquired a belief that any small imperfections in our work will make our entire goal a failure. That’s dangerous, flawed and depressing black and white thinking (as Burns notes in other parts of his book) … but if we believe it and we can’t bear the thought of failure, we’re back to point 1. Some of us refuse to reward ourselves for our own small achievements – which seriously takes the fun out of working on our goals 🙁 … and this can result in us not bothering to do the necessary work to achieve them. Why would we refuse to reward ourselves? … we might have developed a habit of resisting instructions from ourselves too! Finally, on my short list of reasons why we procrastinate on our big life goals… is the realisation that we don’t really want this goal at all! This is a ‘tough one’ to discover after you’ve already committed to, and expended lots of effort (and possibly money) on a big life goal. So, it makes perfect sense to take some ‘time out’ to think carefully about our future plans – and check our emotional engagement with them – before we commit. … if we’re to avoid wasting the energy we’ll need on our valuable projects, we need to quickly decide whether to ride with an idea or leave it in the stable for now. What does not help is allowing ourselves to be consumed by vague and muddled thinking. In my personal coaching, I can help you develop your own, personal (or business) life plan priority list…based on your own prioritisation matrix of the factors that matter most to you. And if that’s of interest, you can contact me here– it’s certainly a great place to start. We might expect, and even embrace, the idea that our children’s lives will change direction, perhaps several times, in the future. However, this isn’t a reason to avoid careful thought about the general direction they’d like to take – at least initially after College or Uni. How else can they have any idea of the course they want to take? Being vague and keeping our options open, didn’t cost us as much in our day. Things are different now and our children don’t have the luxury of free higher education. So, they need to engage in sharper thinking about the ‘value for money’ of their degree or other higher education course – long before they head off on it. And it doesn’t cost much to help them with that. Being more aware of our emotional responses to life’s big challenges makes us better equipped to face into them.